Family camping is a wonderful way to experience the sights and sounds of nature while sharing quality time with the members of your family. It’s not until you remove yourself from modern-day distractions of TVs, CDs DVDs and PCs, that you realize how much technology competes for and commands your attention. Going camping can also be an inexpensive family vacation choice. Family camping can take many forms–-car camping, rv camping, canoeing, backpacking, or just sight-seeing on a leisurely hike. Once you've decided what type of camping experience you and your family want, then you can decide how many people are going, how far you want to travel and how long you plan on being gone. If you’re new to camping, I suggest one to two days and no more than one or two hours drive. The next step is to decide where you’d like to spend your family adventure. The internet is a good tool to discover camping areas and campgrounds in and around your city of residence. Check out the National Park Service, The Forest Service or local campground sites. All of us probably have friends that have gone camping and they would be happy to tell you their favorite places. If you're not sure how to spend your time while camping check out our list of things to do while camping, including star gazing, hiking and cycling. Once you’ve discussed and finalized a camping location with your family it’s vital to make a check list of items you’ll need. That said, I’ve met some campers with lists so long, by the time they gathered all their gear and packed it in the car, I would have returned from my camping trip. What and how much you bring with you depends on how long you intend to touch Indians–-let’s just assume you’ll be gone for the weekend. The most basic approach would be to throw a few sleeping bags in the back of the pickup along with a few cans of beans and a large bag of chips and away you go. But that sounds more like going to a football game, or an old-fashion drive-in movie. In order to get the boy scout feel of the camping spirit, you may want to bring camping gear so you can brag about roughing it for a few days. These days most people are on slim budgets, so look around the house to see what equipment you have. You may have to spend a little to supplement items want to include on your outing. If you plan on bringing camping tents, the amount of people in your family party will determine your tent size. You can spend from as little as twenty dollars to three hundred dollars. Tents are available at any discount store like Target or Wal-Mart. A family camping tent that accommodates four to six people will cost around fifty to sixty dollars. Other good gear to have along is a few camping chairs, a camping shower and enclosure, and fishing tackle supplies if you'll be near a lake. For the adults, if you're a coffee addict then consider a cheap camping coffee pot, a great way to start the morning off by waking up and brewing some coffee. Depending on how far you plan on traveling from your car, you may want to bring a cell phone and a compass. These days you can get a handheld GPS unit that’s lighter than most watches, packed with useful GPS tracking. If you plan on cooking or just heating food, grab the cheapest Coleman butane stove for about twenty-five dollars, some knock around pots and pans, and a couple of battery operated lanterns, or flashlights. If you don’t want to spend time cooking, you can bring canned food, bread and peanut butter. Finally, a good first-aid kit is a must and should include band-aids, gauze, tape, scissors, antiseptic ointment, and aspirin. Don’t forget any prescription medications members of your family may need. Oh, before I forget, bring toilet paper and change in case you have to pay for showers at a campground. Some other fun items to bring along are binoculars, a camera or video camera. 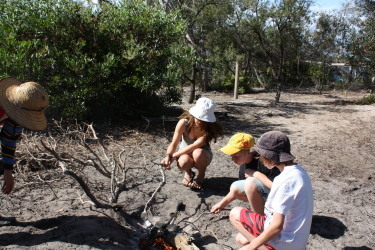 Family camping trips are rare moments shared between members of your family. The moments spent together are simple, clear and focused. Life’s worries and complexities vanish into the clean air, blue sky, and starry nights singing songs and telling stories around a warm campfire. The true value of these family camping trips aren’t realized until your adventure is over and you sift through the lasting treasure chest of memories. Have fun!